I'm not a wine guy. But I had a cabernet at Wilshire recently that was worth trying to track down. I didn't find it, but a Google search directed me to a white wine from the same vintner. The "Winemakers Notes" of their 2007 Viognier were perhaps the oddest description of a wine I've ever read. "This wine has an appealing light straw color. 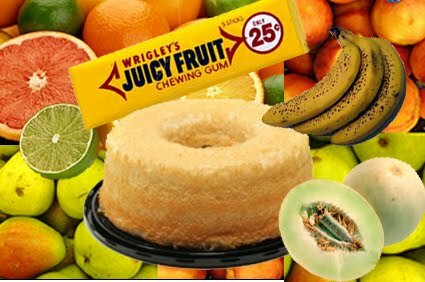 Aromas of Wrigley’s Juicy Fruit gum comes to mind immediately, in addition to ripe banana, grapefruit, lemon-lime, mandarin, pear, honeydew melon and white peach. There is a subtle hint of angel food cake adding to the complexity of this immensely fruity and floral wine; lively flavors of grapefruit and white peach compliment great balance. A wonderfully zesty finish leaves a fresh taste impression." For those of you keeping score at home, the wine tastes like this.